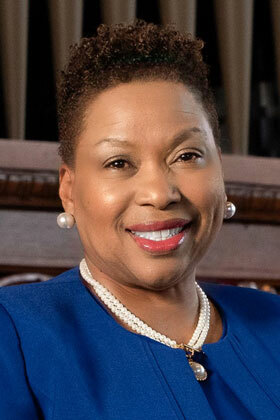 The Board of Trustees of Tougaloo College is pleased to announce the selection of Dr. Carmen J. Walters as the 14th President of this historic institution. As the college celebrates its Sesquicentennial Anniversary and embraces what lies ahead in the new era of higher education, Dr. Walters brings a depth of executive-level leadership and knowledge in such vital areas as strategic planning in enrollment, facilities management, grant and budget management, workforce development, community and diversity relations and athletics management. Dr. Walters succeeds Dr. Beverly Wade Hogan, who is retiring June 30. Dr. Hogan has served as Tougaloo’s president since May 2002. She is the first woman and the 13th president to lead Tougaloo. Walters has served more than 24 years in Community College education. She spent the past six years at Mississippi Gulf Coast Community College in Perkinston, where she is Executive Vice President of Enrollment Management, Student Success and Institutional Relations. Prior to that she worked 18 years at Delgado Community College in New Orleans. Dr. Walters received a Bachelor of Science in accounting and business administration from Southern (La.) University in 1984, a Master of Arts degree in postsecondary counseling from Xavier College in New Orleans in 1990 and her PhD in Community College leadership from Mississippi State University in 2009. She is married to Wayne Walters, and the couple has two grown daughters — Taeshaun Walters and Tierra Walters Mackie.